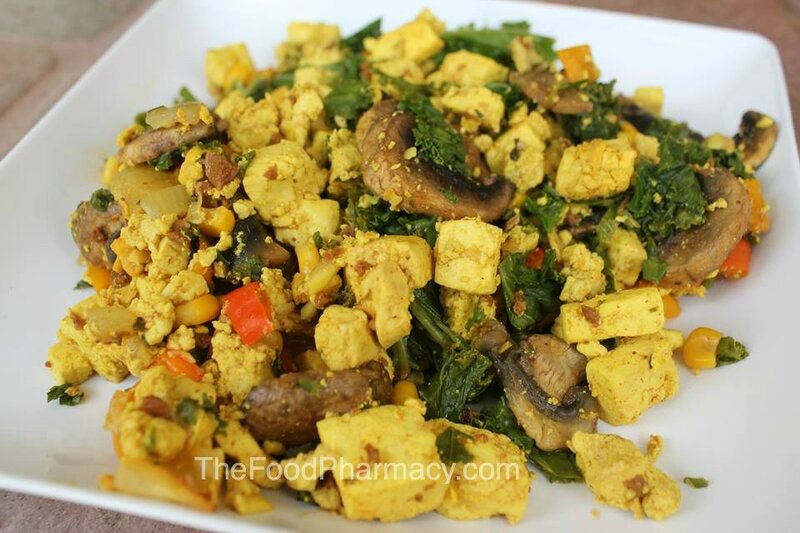 Tofu scramble is a popular scrambled egg substitute. It is simple and easy to make at home with many variations of spices and toppings. Drain the tofu well and cut into small cubes. Cook in wok or large skillet for 10-15 minutes or until liquid is absorbed (may have to drain excess liquid couple times). Season tofu with Herbamare, turmeric, oregano, liquid smoke and cook for 5 minutes. Add the onions, pepper and garlic and cook for 2 minutes. Add the mushrooms, and corn, stir well and cook for 2 minutes. Add the spinach or kale and salsa. Cook on low heat for 3 minutes. Mix well and serve topped with diced grape tomatoes and cilantro. Enjoy!